Are you using the full capacity of your mind? Learn how to turn your hunches and gut instinct into a strong intuitive sense. Like any skill, it just takes learning how to develop and use it. Created by a seasoned psychic and educator, use the workbook daily over two to three months, and discover that you have ESP when you need it! In these challenging times, it helps to have an edge, and your intuition can give you that. It is an important part of being a well-rounded person. Intuitive insights may bring out issues or information that you would otherwise not have considered. Why not use the full capacities of your mind—your analytical mind and your intuition? “This is an imminently useful and practical book for those serious about developing and using their innate psychic abilities. 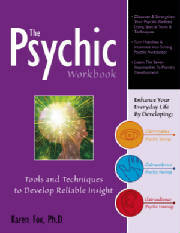 From her years of experience instructing people – adults and children – in tried and true methods of developing reliable, accessible psychic “muscle”, Fox presents a dazzling array of techniques, methodology, and tips that enable the student to confidently develop their own unique ways of accessing their psychic senses. Fox’s warm and clear writing style engages the student with a myriad of exercises that will open and strengthen their psychic abilities. Illustrating the ‘why’ behind each exercise with the experiences of real students as well as her own, she explains the methodology behind each technique concisely thus creating building blocks of knowledge and experience for the practitioner. Develop the Full Capacity of Your Mind!